Seeing a SENNEBOGEN 875 R-HD in action sealed the deal A trip to the Charleston Bulk Transfer (CBT) facility operated by Maybank Industries Group in South Carolina was in order. Lee Gibson of Gibson Machinery, one of SENNEBOGEN’s longest standing distributors, joined Theodorakos and his team to watch CBT’s recently acquired SENNEBOGEN 875 R-HD in operation. Located on the The Charleston Bulk Transfer facility, which is located on the Cooper River moves upwards of 12,500 tons of coal per day from barge to shore. This convinced Theodorakos that a similar machine would be ideal for his operations with Donora Dock LLC. While SENNEBOGEN completed assembly of their new SENNEBOGEN 875 R-HD, the Robindale team returned to Donora to commence operations with a SENNEBOGEN 850 M. The rubber-tired 850 M was fitted with a 5 yd. bucket. By the time the 875 arrived this summer, the 850 had earned a permanent place in the Donora fleet, as a back-up and supplement to the larger machine. 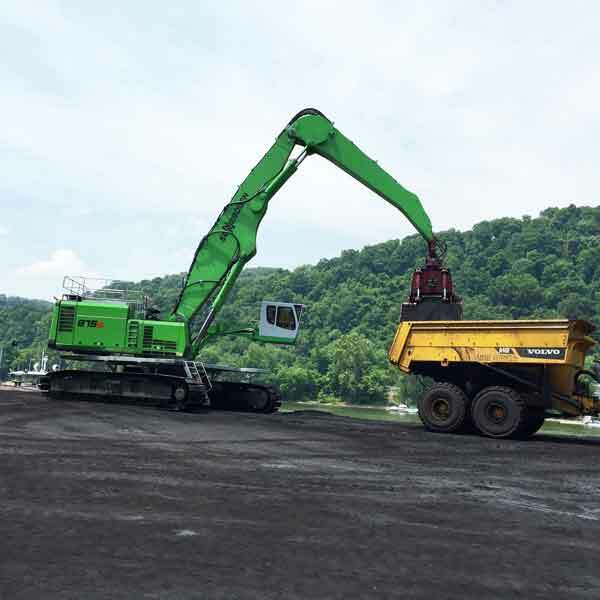 After testing the 875 through a few hundred operating hours, the onsite manager of the Donora Dock, John Ross remains convinced that this machine was the right choice. Swinging its 14 yd. coal bucket through several loading cycles per minute, he says the machine has the potential to offload as many as 6 jumbo barges in a day. “But the biggest thing is the fuel!” Ross continues. “In 39 years, I never saw machines that big use so little fuel.” Recalling the 43% saving in diesel costs that CBT has achieved in Charleston, the machine in Donora is “right on track” to produce comparable results.